Mobilization and Reassembly of Genetic Information documents the proceedings of the Miami Winter Symposium, sponsored by the Department of Biochemistry, University of Miami School of Medicine, Miami, Florida, January 1977. 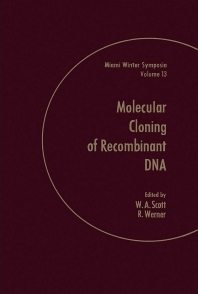 This volume is the 13th in the ""Miami Winter Symposia"" series. Topics for the Miami Winter Symposia focus on areas of biochemistry in which recent progress offers new insights into the molecular basis of biological phenomena. The manuscripts presented by researchers at the symposium cover a wide range of topics including DNA cloning and plasmid biology; yeast DNA expression in Escherichia coli; characterization of tetracycline and ampicillin resistant plasmid cloning vehicles; eukaryotic genome organization; bacterial plasmids containing silk gene sequences; DNA cloning in bacteria for the study of immunoglobulin genes; DNA degradation by rat intestinal nucleases; recombination between bacterial plasmids leading to the formation of plasmid multimers; general methods for inserting specific DNA sequences in cloning vehicles; and cloning and characterization of yeast DNA.